Upgraded shaders and improved shader performance. Added a “lock UI” toggle in the top-right hand corner of the interface. Prevents any UI windows being moved when locked. 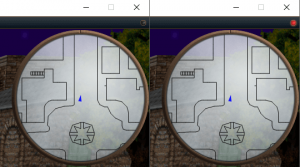 When the circle is red, the UI windows can be moved. Added an in-game text language toggle in the Gameplay menu in Options, allowing the in-game text to be displayed in German. Added German chat commands (e.g. ‘zaubern’ will work for ‘cast’). Block camera rotation around the player in first-person mode (i.e. lock the camera facing forwards). Ignore current target for mouseover/clicking, to allow selecting an object behind or in front of your current selected target. Replaced ‘Network Error’ standard error box with a themed UI one. Fixed a bug causing disappearing UI windows. Fixed a bug with chat history scrolling. Misc performance changes (graphics loading, string handling). Improved spell/skill description dialog boxes – now lists mana and vigor costs if applicable, and spells will list reagents separately. Refactored health/mana/vigor systems. Most notable effect of this is that having multiple mana draining effects present will cause a steady resource drain, rather than a twitching mana bar. Maximum mana now scales smoothly with mysticism rather than requiring a multiple of 5, so a player with 46 mysticism and all nodes will have more mana than a player with 45 mysticism. Resting now doubles the rate of health and mana regeneration. However, resting players will always be hit by attackers. Poison now drains health and vigor at a steady rate, rather than subtracting vigor at the start and health every 10 seconds. Ring of Lethargy now slowly drains vigor. Once the player hits 0 vigor, the ring will automatically unequip. Tokens will drain vigor steadily rather than in discrete jumps, and will no longer display a ‘vigor drain’ message to the player. Added visual cues to the minimap for monsters targeting the player (black ring around red dot) and monsters targeting others (white ring around red dot). The minimap in the classic client is now much more responsive to zooming in/out. Improved HW renderer performance in classic client. Monsters now have all 6 stats, randomized based on several factors for each monster. Might allows them to hit harder, agility allows dodging and faster movement, aim grants more offense and an increased range and sight, stamina will boost a monster’s health and recovery rates, mysticism will bestow the monster with a greater mana pool and intellect will increase a monsters vision rate and chance to cast spells. Randomization of monster stats on creation means there is some variability in monsters of a given type (e.g. some avars will hit harder than others). 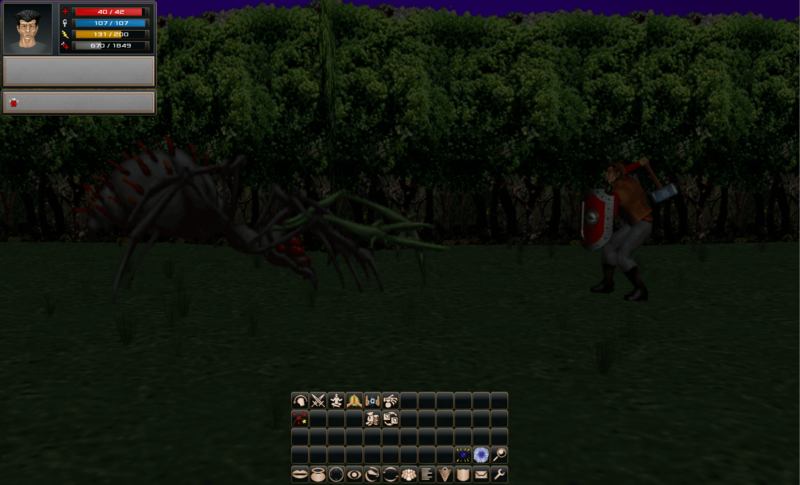 Monsters now have vigor, and can run out from attacking, casting or chasing a player which will cause them to slow down and/or rest for a short time. Monsters will regenerate health in the same way players do, meaning they can regenerate during a fight (previously this only occurred while moving). Poison can now be applied to monsters, which will die if they reach zero health. Kriipa no longer jump back up to the ceiling while fighting. Also, their first attack upon dropping down from the ceiling can do double damage (ambush attack). Some monsters now have drain effects – Bleed applies damage over time, Siphon drains mana over time and Fatigue drains vigor over time. Monsters now move around a room in a more organic manner. Some monsters are social and will group up with other monsters of the same type (e.g. faction troops are social, skeletons are not). Social monsters are more likely to join in a fight if their allies are attacked. Monster aggro is now more proximity based. When a player enters a room, the closest monsters will aggro first. Aggro now persists to some degree and is based upon the amount of aggression a player has shown towards a monster. That means that a monster will not have forgotten about a player that has left the map and enters it again. Monsters may also switch targets more readily if someone else gains their attention. Aggro range is based upon a player’s ‘stealth’, which takes into account their agility and intellect, their movement speed and their visibility (standing around a corner, light, invisibility, shadow form). This means that players may literally sneak up on a mob or cast darkness to make their moves harder to detect and avoid aggression. Aggro range will fall off if a player is not within the monster’s level range, allowing tough adventurers to stay clear from critters and weaker players to enjoy some safety from tough opponents. Faction troops will now help out players of the same faction that are fighting near them. Troops that are helping/following a player will show up on the minimap as an orange dot to the player being helped. Monsters will now sometimes fight and kill each other, but slain monsters will not drop loot unless a player is involved in their demise. Boss monsters now give bonus XP/TP. Living statues will become dormant when they are no longer engaged in combat. Second Wind still increases resting cap to 100, but no longer has a “kick in” effect. Instead, it allows players to regenerate vigor below the threshold without resting and will greatly boost vigor and health regeneration when dropping to critical levels. Second Wind has a chance to improve each time a player regenerates a point of vigor below the threshold without resting. Mark of Dishonor no longer affects a targets max health but will freeze their health regeneration and apply a damage over time effect depending on the target’s karma. Positive karma targets only suffer from stopped regeneration, while negative karma targets will lose up to 2 points of health per second. Radius enchantment mana drain restored to pre-2.0 patch levels. Reflections now show an enchantment icon for each reflection created. Poison Fog now works on monsters. Anti-Magic Aura is now a self-only personal enchantment. It will lower the spellpower of incoming single-target spells and all outgoing spells by half the spellpower AMA was cast with. Lasts for 30-120 seconds based on spellpower. Mana Convergence is now an attack spell that drains mana from enemies around the caster. Drains 1 mana every 4-5 seconds, giving any mana drained to the caster. Fixed undershirt showing on top of soldier shield on a player’s back in rare circumstances. Fixed teleportation scroll not working correctly in Historic East Ende. Projectiles no longer hang stationary in mid-air in the classic client. Statues in Hall of Heroes and logoff ghosts will now correctly display helms, circlets and masks. Phase/logoff ghost time remaining is now reset when a player’s status (innocent/murderer) changes. Fix some bugs with the DM ‘dm plain’ command not making a DM visible again. Fixed lutes not showing the dynamic lighting effect when enchanted with glow. Fixed players’ light level sometimes dropping too low. Removed the ‘player phased in’ message if the player phases in as a result of running out of phase time. Fix rare classic client crashes due to changing music settings. Fixed incorrect room music being played sometimes if a player switched music off/on. The logon delay paralyze effect now uses the Hold spell, fixing cases where it was possible to perform an action before the delay ended. Fixed white outlines around some scenery objects in classic client. Fixed incorrect ambient lighting when room lighting changes in classic client. meridian 59, Meridian 59 server 105, Meridian 59 update, mmorpg. Bookmark.